Jonathan Blow has been very upfront about the meaning of Braid. In an interview with Chris Dahlen of the Onion A.V. Club, he says it plainly: "In fact, I do have a very specific meaning behind everything in the game. Everything has a purpose, not just in the levels, but in every word." "I feel that a lot of people are a little bit too quick to take concrete bits of evidence that they find and that they recognize, and to use those to create a definitive explanation of everything and to bend all other facts to fit that explanation. Whereas, why didn't you take those facts that you found and bend those facts to fit other facts to make another explanation?" Although he mentions he was an English major at Berkeley, I fear that Blow did not learn what has become the major's central tenant (one that it shares with the college in general): It is not the intention that matters, it is the interpretation. People bend facts to fit their interpretation because that is how humans make sense of their lives. Whether one writes a novel, conducts research in theoretical physics, or records history, the meaning is ultimately derived from the interpretation of the work, rather than the work itself. In this spirit, I'd like to share why Braid resonated with me on a personal level. I will try to make my reasoning clear and weave the narrative themes and the gameplay together. I know that this is likely not what you had in mind, Jonathan, but I hope that your frustration with players has dulled; that people care enough to integrate the game into their worldviews seems like one of the highest complements one could offer. In my other life, I study history. I do so less out of a love for trivia and more due to a wistful longing to understand choices, their consequences, and their contemporary application. I find myself agonizing over both grand and irrelevant decisions because I know that my knowledge of the soon-to-be past will make me better equipped to make a decision that has already been lost. I take comfort in the hope that I will someday face a similar decision, so that I can attempt to learn from the mistakes. Playing a video game is one of the rare times in which a person can own the benefits of history without being burdened by its consequences. Every mistake in a video game can be learned from and corrected. Braid takes this underlying concept and pushes it to the forefront: the rewind mechanic is a literal version of what we do when we restart a Mario level or re-load a quicksave in Mass Effect. It shows us our mistakes, scrubs off any painful consequences, and lets me have another chance. This is a fantasy that I will chase for my whole life, knowing that I will never attain it. For a moment, Braid gives me the feeling that I just might do it. "Visiting his parents' home for a holiday meal, Tim felt as though he had regressed to those long-ago years when he lived under their roof, oppressed by their insistence on upholding strange values which, to him, were meaningless. Back then, bickering would erupt over drops of gravy spilt onto the tablecloth. Escaping, Tim walked in the cool air toward the university he'd attended after moving out of his parents' home. As he distanced himself from that troubling house, he felt the embarrassment of childhood fading into the past. But now he stepped into all the insecurities he'd felt at the university all the panic of walking a social tightrope. Tim only felt relieved after the whole visit was over, sitting back home in the present, steeped in contrast: he saw how he'd improved so much from those old days." I am lucky to have a good relationship with my parents, but even so, the game succeeded in articulating the complicated feelings associated with the transition out of of childhood. The text invokes the holidays, the time that many people who have moved away from their parents briefly re-visit their childhood homes. Most winters, I find myself back home, shuddering at the thought of regressing to the immaturity of those days. Like the world's accompanying portrait, I feel spied on by the past itself, conspicuous and trapped around the baubles that belonged to a person that I no longer am. Like Tim, I consider a myself a vast improvement over that past being. However, try as I might to consign those fears to the depths of my brain, physically traveling to those places somehow transports me back in time. 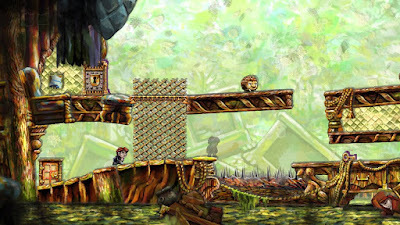 In World 4, Braid gives this abstract feeling an immediate structure by causing time to rewind as the player moves backwards. 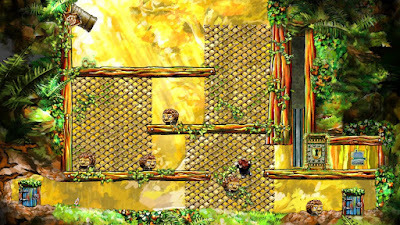 Braid's gameplay externalizes the feeling of traveling backwards through time by extending the metaphor into a gameplay reality. Time stands still if I do, I find myself in the past if I go backwards, and time only glows if I myself progress. It is a frighteningly apt portrayal of the emotional link between time and space. "But the ring makes its presence known. It shines out to others like a beacon of warning. It makes people slow to approach. Suspicion, distrust. Interactions are torpedoed before Tim can open his mouth." "In time he learns to deal with others carefully. He matches their hesitant pace, tracing a soft path through their defenses. But this exhausts him, and it only works to a limited degree. It doesn't get him what he needs." In Braid, marriage warps the social and physical reality around Tim. Specifically, the ring acts as a symbol that changes the way people act towards him, which in turn effects the way he relates to them. Somehow, the symbol alters his identity before he can explain himself. This social phenomenon is represented in the gameplay as a ring that exudes a sphere that slows down time within its radius. Just as the people who get too close to him hesitate, so do the objects that venture towards the ring. Long before I played Braid, I noticed this phenomenon happening around me. Although I do not wear a ring yet, even telling people that I am getting married elicits odd reactions. While I do not feel any different, I can see some people subtly morph as I tell them my plans. Often, older folks get protective or wistful. Younger folks tend to get suspicious, incredulous, and perhaps even slightly jealous. Regardless of how they react, I feel myself transformed from a person into a representation of an idea. It feels like I am both more and less than a person; I am the manifestation of a social construction, a representation of a both troubled and beautiful institution that threatens to subsume my identity. Like Tim, I must subtly, yet deliberately convince people of my intentions, perhaps even of my discrete existence. It was an unforeseen consequence of getting engaged, one that has been exceedingly hard to describe. Seeing it represented thematically, visually, and ludically in Braid is something that I will remember forever. 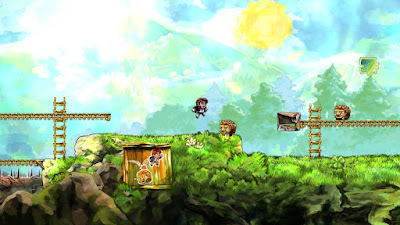 I understand people who say that they are underwhelmed by Braid. I find myself comparing it to a book that has always underwhelmed me: Catcher in the Rye. Even when I was a teenager, I had little affinity for Holden or his situation, and learning more about J.D. Salinger only reinforced this feeling of alienation. Intellectually, I recognize its meaning for those who feel a personal connection and I sometimes wish I could share the experience. In the case of Braid, I am one of the lucky ones on the inside: I find echoes of my own life within the game and in the ideas of its ornery creator. Braid is an extremely personal game, as is evidenced by copious amount of fan analysis and Blow's reaction to the theories. Intentionally or not, Braid's capacity to accommodate a multitude of personal meanings allows it to transcend the intentions of any single individual. "I guess I think I'm writing for people who are smarter than I am, because then I'll be doing something that's worth their time. I'd be very afraid to write from a position where I consciously thought I was smarter than most of my readers." I feel like Blow made Braid while consciously aware he was being smarter than his players. He is the puzzle master, and our acquisition of the puzzle pieces has us playing into his hands; it confirms his status as our intellectual superior. The most challenging and meaningful puzzle in Braid is, of course, its meaning. As long as we don't understand Blow's intended meaning, we're stupider than him. This is what he wants, if only subconsciously. If he had created Braid with an attitude of it being for people who were smarter than him than he would welcome our interpretations. He would have made it FOR our interpretations, like you say--not to say something unequivocal but to allow us to explore a possibility/meaning space. Anyway...that Sontag quote has been making me crazy and shaping the way I think about games and designers. I need to sleep on it. While that sort of intentionality is disturbing, Blow speaking down to his audience, I don’t really think it matters. Just as Scott pointed out, intentionality doesn’t really matter. It might on the surface level, the conceptual level, but as soon as something is released to the public, it becomes public analysis that ultimately shapes the piece. Just like artwork, a novel, a poem, anything. Once a creator has finished with a work they have no more authority to interpret it than anyone else. Their authotative input on it ends once they release it into the wild. It's becomes the audiences work to place themselves in it. So whatever interpretation Mr. Blow has on Braid is just as valid, not moreso, than anyone elses so long as they can back it up. I didn't mention Braid or Blow in my post, because he has been misquoted on occation, but the concept of how he's being quoted here deserves to be responded to. Is Johnathan Blow an Auteur? Doesn't really matter. Auteur theory is about looking at a body of work and seeing the common elements that drove their creation. Blow doens't really have a body of work that we can examine. I think Braid is it and before that he was just a theorist. Correct me if I am wrong. Thanks for sharing the quote; it's quite thought provoking. What worries me most is that, at least for a while, Blow seemed to challenge the audience only to scorn their efforts to meet his challenge. Every once in a while, I'll write or say something that I feel can only be interpreted one way, only to find someone who instantly either finds a hole in the logic or constructs a completely valid alternative interpretation based on the elements I provided. There is a small, petty part of my brain that shouts "No! You missed the point!" Of course, like you say, this is really displaced frustration: in reality I am frustrated that I didn't think of the interpretation and address it in my original work. If I spent years of my life and hundreds of thousands of dollars on a project, I can easily see how this feeling could be magnified. I think a lot of the Braid criticism happened fast, while everyone's emotions were a bit raw. While the creator's interpretation may not have any more authority once they release their work, it would still be interesting to hear them articulate their intention. Even the simple fact of discerning original intent can make a huge difference as to how people interpret something, so it would be a shame if we never hear Blow's interpretation of the game.